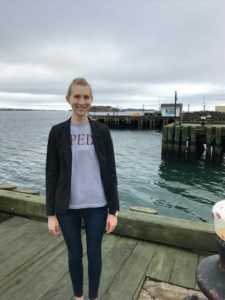 This past November, IPED graduate student Stephanie Swinehart represented Fordham at the 5 th Annual Sustainable Ocean Summit sponsored by the World Ocean Council, held in Halifax, Canada. 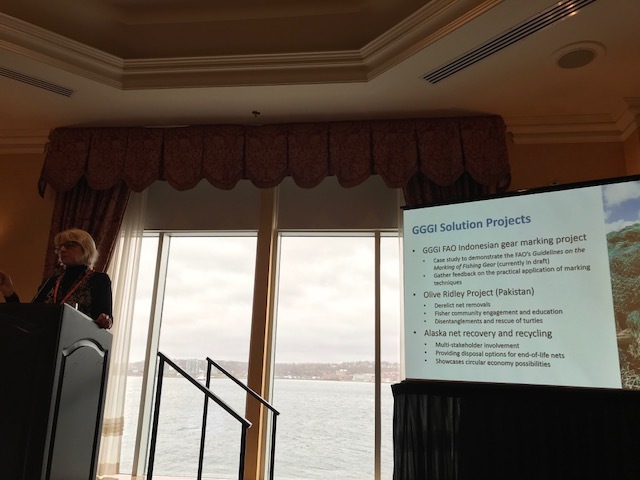 The conference theme, “The Ocean Sustainable Development Goal (SDG 14): Business Leadership and Business Opportunities” centered on the interconnections between sustainable development, scientific innovation, and stewardship of the global ocean. Stephanie in front of Halifax Harbor. The realities of climate change are particularly pronounced for the oceans. Rising sea levels, acidification, and declining fish stocks all pose significant threats to the billions of people living near the coasts. Combined with a rising global population and changes in climate patterns across the world, the implications of climate change for the world’s most vulnerable population in terms of food security and climate migration are immense. 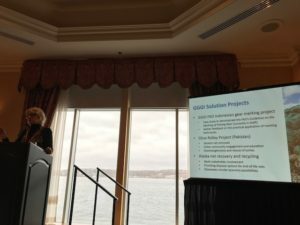 The variety of issues discussed at the conference included ocean energy, illegal fishing, indigenous community rights, extractive industries, ocean pollution, arctic exploration, and ocean mapping/satellite technology. Presentation on how extractive industries can responsibility contribute to the Sustainable Development Goals (SDGs). “Economic development and poverty reduction do not have to be zero-sum, but all the stakeholders must be at the table. Forums like this, where industry and community meet, are critical to ensuring that businesses take into account those that don’t have a voice on the international stage,” writes Stephanie. Organizations present included the United Nations system (United Nations Framework Convention on Climate Change and the Food and Agriculture Organization), government representatives from Small Island Developing States, and major oil and gas companies in addition to marine scientists and academics from universities around the world. Lynn Kavanagh of the Global Ghost Gear Initiative talks about the discarded fishing gear that makes up 1/10 th of the world’s marine debris. Representing 70% of the earth’s surface, protecting the world’s oceans is of critical importance and something to which each one of us can contribute. 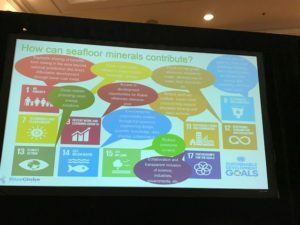 “These are not issues for discussion only at conferences or on a global stage”, reminds Stephanie, “but are actions we all must take as development practitioners.” Reducing single-use plastics (straws, to-go containers), energy consumption, and eating sustainably-caught seafood are all ways to make an individual impact. For more information on what you can do, please visit National Geographic or the Monterey Bay Aquarium Seafood Watch.